This isn't an April Fools joke! Leave it to Gerber to time and time again, come out with amazingly innovative tools that push that bar in the multi-tool category. Today we'll tell you about the new Gerber EVO Tool, because this one is no exception. The thing that sets the EVO apart is that it exudes simplistic style and features that have all outboard components. Now what does that mean, exactly? There is no need to open the handles to access tools. 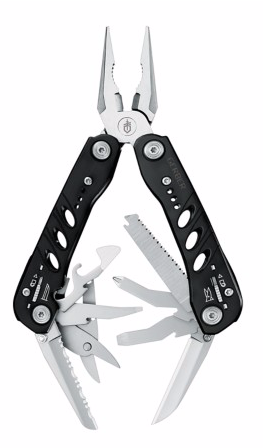 Each component is locking which makes these tools among the safest out there! When it's time to use the pliers, they're spring loaded so it reduces user fatigue during extended use. The Gerber EVO comes in at 6" in length, and a closed length of 3.94". It weighs only 10.25oz, and comes with a ballistic nylon sheath to keep it safe. Grab your EVO today so when it comes back into stock you can be first to get it and put it to good use!